A generation ago, organ recitals in the U.S. seemed to be a dying form for the general public, with only a small number of internationally renowned performers drawing substantial audiences, mostly in larger cities. Then many determined artists took up the challenge of countering this trend with passion and creativity. 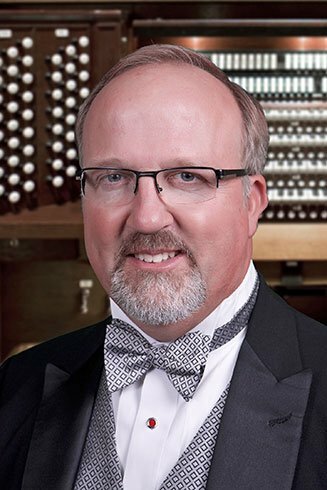 Peter Edwin Krasinski, past Dean of the Boston Chapter of the American Guild of Organists, is a prime example. While serving as a church and temple organist as well as teacher, he has built an enviable reputation as a gifted improviser and silent film accompanist. On June 14th he presented a program at the Methuen Memorial Music Hall that not very long ago would have made more traditional-minded organists blanch, yet he received a rapturous response. Billed as displaying “three personalities from the King of Instruments”—the concert hall, the church, and the theater/popular song—it contained only two original organ works, putting the emphasis on adaptations (mostly by the performer) of music for orchestra, big band, and even rock band. Krasinski drew an amazingly wide range of colors and textures from the famous 1862 Walcker organ in as eclectic a recital as I have ever heard. The arresting opener, part of the “Concert Hall” group, was the iconic first movement of Beethoven’s Fifth Symphony. This was not an ideal choice for this organ, since the three repeated notes of its famous main theme were all but impossible to articulate at louder dynamic levels in such a live acoustic; frequent lower-octave doublings only worsened the problem. Nonetheless, the dramatic force of the music felt ever present. The antiphonal passage in the coda worked to especially great effect. Unfortunately, the piece ended with the cipher of a 32’ stop, requiring several men to enter the innards of the organ to stop the obstinately sounding bass note. Krasinski showed a talent for verbal improvisation here, filling time by making an unplanned but entertaining and informative speech about the upcoming pieces. The remaining concert hall pieces rather better suited the organ. Papageno’s birdcatcher aria, from Mozart’s The Magic Flute, charmed with its buoyancy and shepherd’s pipe. The artist found seemingly every lush string celeste combination on the organ in Elgar’s “Nimrod” from the Enigma Variations, though I personally would have preferred fewer changes of registration to allow us to savor fewer of them. The highlight of the set, Chabrier’s España, brimmed with sunny Spanish exuberance and rhythmic verve. Interestingly, the somewhat less frequent registration changes in this interpretation made it more convincingly orchestral, and Krasinski found some delicious and exotic sounds. It was also very much a display piece with some rapid-fire changes among all four manuals, and a brilliant, emphatic ending. For the “Church” section, the performer gave an affectionate rendering of the old chestnut, “The Lost Chord,” by Sir Arthur Sullivan. The thoughtful inclusion in our booklets of the quaintly Victorian poem by Adelaide Anne Procter (the piece was originally set as a song by Sullivan) allowed us to appreciate Krasinski’s skill in marrying musical images to (imagined) visual ones. Again his registrations displayed an impressive array of deliciously schmaltzy flavors. He next improvised on the tune of “Amazing Grace” (aka New Britain), flirting briefly with bitonality and taking us on another kaleidoscopic tour of the innumerable sound-colors this organ offers. After building to an impressive extended climax, the improvisation subsided to shimmering celestes accompanying chimes by the end. O Mensch, bewein dein Sünde gross, BWV 622, (O Man, Bewail Your Grievous Sin), one of J.S. Bach’s most beloved chorale preludes, is a beautiful and profound expression of remorse. I might have preferred more registrational restraint (i.e., one combination throughout) and greater flexibility of ornamentation, but the artist played with palpable reverence and warmth. Then in a rough-and-ready performance of Handel’s Hallelujah Chorus, the audience did the singing. Though the organ accompaniment tilted towards the lower-pitched stops and could have used more bright upperwork, the powerful bass line did keep the less experienced singers mostly in the right place; the assemblage had a good time making a joyful noise unto the Lord. After intermission the recitalist returned in a florid, rococo dinner jacket with quasi-matching bowtie—in homage to Virgil Fox? “Theater and Popular Song” began with Albert Ketelbey’s “In a Persian Market (1920),” an example of light classical music for orchestra with optional chorus, is now rather popular as arranged for organ solo. It is Persia as viewed by an Englishman, much as the España rhapsody heard earlier was a French composer’s conception of Spain. Akin to a Middle Eastern Pictures at an Exhibition, its series of exotic tableaux depicted various characters (e.g., Krasinski mentioned an “oboe-playing snake”) with appropriately colorful stop-combinations. Unsurprisingly, “In the Mood” may not have had a sound evoking the Glenn Miller Band, but it possessed the appropriate jaunty swing, and the player had fun with the walking bass in the pedal. After some increasingly fancy riffs, he ended with the flourish of an upward glissando. Duke Ellington’s “Mood Indigo” made a luscious and laid-back contrast to the more energetic pieces preceding it. We heard a variety of solo voices, and the use of supercouplers gave the accompanying celestes a little more luster without losing any richness. The second bit of audience participation came in a medley of seven Beatles favorites—“I Want to Hold Your Hand,” “Penny Lane,” “Yesterday,” “Michelle,” “Yellow Submarine,” “When I’m Sixty-Four,” “and Let It Be” —appealing on paper but less successful in execution. In contrast to the four-part Hallelujah Chorus we were obliged to sing these in unison which was frequently uncomfortable for low voices, while the organ accompaniments were considerably less varied than in the rest of the program. In short, after two or three songs, it mostly felt like much of a muchness. The highlight for this listener, though, was “Yellow Submarine” for its rollicking party atmosphere complete with shouted interjections. Krasinski concluded with a medley from Leonard Bernstein’s West Side Story. “I Want to Be in America” danced with a full measure of lively Latin energy, and if the repeated chords again sounded unclear sometimes, it mattered less than in the Beethoven. The melody of “Maria” sounded appropriately in the tenor voice; the moderate embellishment of Bernstein’s notes respected his style and gave no offense, and although “Officer Krupke” was so gussied up as to be scarcely recognizable at first, the entire outing was undeniably fun. The memorable melody of “Tonight” stayed clear amid an increasingly complex accompaniment. “Make of Our Hearts One Heart” was simple, chaste, and lovely—almost too brief. “There’s a Place for Us” got a bit over-fancy for a time, and distracted slightly from the yearning optimism of the song, but the calm ending with chimes was quite affecting. Doubtless there remain some organists and audiences who are unsettled by the idea of venturing beyond the boundaries of proper organ repertoire (whatever that term encompasses), but it seems likely they are nowadays in the minority. Particularly given an organ with such a wealth of colors as this, it seems quite natural to explore them in creative and unconventional ways, and indeed, the audience’s elated response to this recital recognized that Peter Krasinski is a leader in this direction. I’m always grateful for the informed reviews on this site – critiques written by and for musicians. That being said, and NOT having attended this performance (although I wish I had), Mr. Kransinski apparently approached this performance to both entertain the audience and showcase the organ’s considerable resources. My takeaway, from the review, is that Mr. Kransisinski’s performance accomplished both goals. The near-term future of the pipe organ, at this point, is apparently dependent on attracting younger people to its potential for musical excitement. As a product of the “golden age” of the ’60s and ’70s, I recognize that the ecclesiastical and scholarly goals we pursued have diminished in relevance. To ensure the future of the instrument, different approaches are necessary. Thank you, Mr. Krasinski, for contributing to the pipe organ’s future!